The Rails hosted their 20th Lincoln Invite on Saturday (9/23)! The invite now includes 7 teams total, Boone, Carroll, CB Abraham Lincoln, CR Washington, East, Indianola, and Lincoln. Over the last several seasons, this invite has grown to be very competitive, providing great races for all who attend. This year proved to be no different with four teams in the top 25 in the power ranking standings! 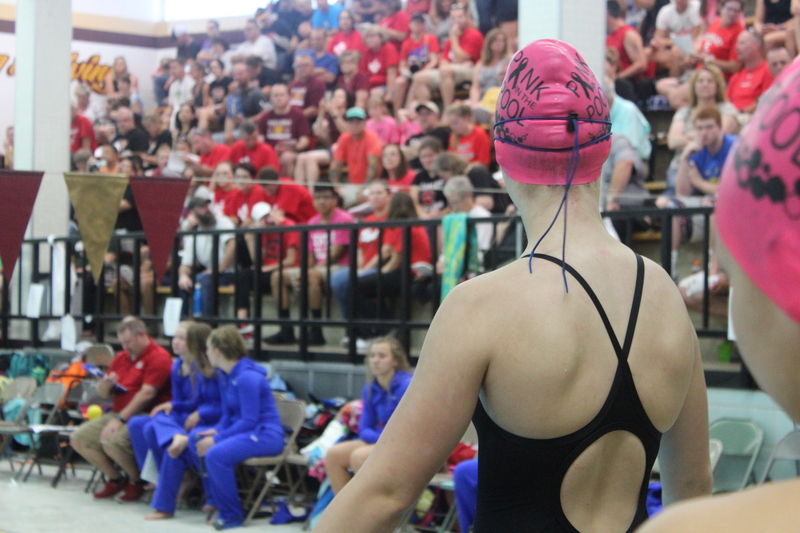 But equally important as the swimming was the community support for Susan G. Komen of Iowa. “This meet is great because it’s super energetic. And it important to me personally because of my mom’s friend, Lisa Roberts, who is a breast cancer survivor,” said Cat Dooley, sophomore. Fans turned out in big numbers to buy t-shirts, pink apparel, and programs. The net profits from those sales will be donated to support breast cancer treatments and research. Lincoln Activities also donated a portion of the gate admissions from the day! Overall, the Rails had a good day in the water! The best another “wall meet” score moving up from last years 5th place finish to this year’s 2nd place finish! While we can’t recognize everyone, below are some highlights from the meet. Anika Snow earned fourth overall in the 100 Free with a 58.10! Below are few photos from the meet. More can be viewed on the team’s photo website (link in the upper right corner).